1. Halong Bay. Located on the West Bank of the Tonkin Gulf, including the island waters of Ha Long City, Cam Pha City and part of Van Don Island District, Quang Ninh Province. Halong Bay has a 120 km coastline with an area of ​​about 1,553 square kilometers including 1,969 large and small islands, most of which are limestone islands, of which the core of the bay is 335 square kilometers of dense 775 islands big small. Not only beautiful because of the “clouds of water”, the poetic beauty or the countless limestone islands floating on the water, Ha Long also give visitors a sense of peace when immersed in the scenery here. 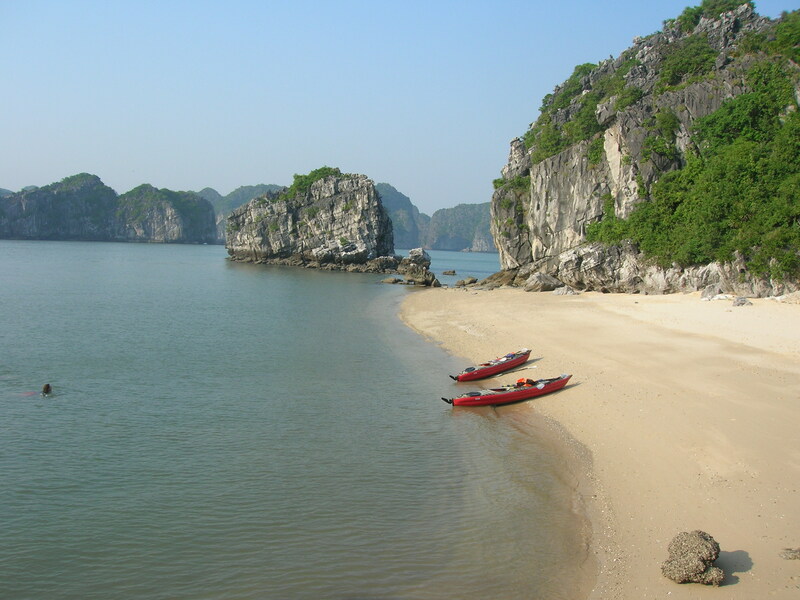 Rated as one of the 29 most beautiful bays in the world, the end of March 2012, New Open World Organization has officially recognized Ha Long Bay as one of the seven new natural wonders of the world. 2. Thien Mu Pagoda Also known as Linh Mu Pagoda, is the ancient temple located on Ha Khe Hill, on the left bank of the Huong River, about 5km west of Hue city center. Thien Mu Pagoda was officially built in the year of the Tan Suu (1601), the first princess Nguyen Hoang, the first Nguyen Lord in Cochinchina. With natural beauty and large scale, Thien Mu Pagoda became the most beautiful temple of that time. Thien Mu Pagoda has been used as a temple during the Tay Son Dynasty (around 1788), and was restored many times under the Nguyen dynasty. Today, the pagoda continues to be more and more magnificent, magnificent and always attractive, attracting many tourists near and far. 3. Hoan Kiem Lake. Also known as Ho Guom, is the natural freshwater lake of Hanoi, the lake has an area of ​​about 12 hectares. Previously, the lake also had the name: Luc Thuy Lake, Thuy Quan Lake, Ta Vong and Huu Vong Lake, the name of Hoan Kiem appeared in the early 15th century associated with the legend of Le Thai To King to pay the sword to the Turtle. God. Hoan Kiem Lake is associated with the legendary legend, the symbol of the thirst for peace, the virtuosic talents of the Vietnamese nation. Thus, many artists have taken the image of Ho Guom as the basis for their works. 4. Hoi An. Hoi An City is located on the northern bank of Thu Bon River, about 25km south-east of Da Nang, about 50km northeast of Tam Ky. From the 16th and 17th centuries, this place was known as Faifoo, a trading and trading center for Japanese, Chinese, Portuguese and Italian merchants in Southeast Asia. Hoi An today preserves the status quo of the ancient architectural and intangible cultural heritage of traditional customs, beliefs, folk arts, cultural festivals, villages traditional cuisine … In addition, the culinary culture in Hoi An is one of the special things that visitors often mention, if you have not come here to enjoy traditional dishes such as Cao lau, noodle Quang , the cake “white rose” … is like never to Hoi An. 5. Phu Quoc. The island is also known as Ngoc Island, the largest island in Vietnam, also the largest island in a population of 22 islands in the Gulf of Thailand. Phu Quoc island and other islands form the Phu Quoc island district of Kien Giang province. The whole island district has a total area of ​​589.23 square kilometers. In 2008, the Concierge.com website (specializing in travel in Australia) announced that Long Beach is one of the 13 most pristine beaches in the world. In addition, Phu Quoc is the place to produce a fish sauce not only famous in Vietnam but also known around the world. 6. Sa Pa terraces. Sa Pa is a highland town in northwestern Vietnam, where terraces are beautiful, stretching as they rise to the sky. With beautiful natural scenery, poetic moments, mysterious markets and delicious food, Sa Pa has “fascinated” most of the visitors when they arrived here. In 2009, Travel and Leisure Magazine (USA) also voted Sa Pa terraces as one of the seven most beautiful terrain fields in Asia and the world. In December 2011, Lonely Planet Travel magazine introduced Sa Pa as one of the 10 best places in the world for walking, and in early November 2013, the Ministry of Culture, Sports and Tourism Tourism has also decided to rank Saab terraced fields as national heritage sites. The most famous person in Viet Nam is 127. Mui Ne. It is a popular tourist center of the South Central, 22km north of Phan Thiet City (Binh Thuan Province), where it is a strip of unspoiled green coastline with red sand hills stretching The 10 most visited tourist sites in Viet Nam look like 13Mui Ne also attract tourists by many historical-cultural relics of a diverse culture, multi-cultural. The Cham, Water Tower, Ong Pagoda, Thien Hau Pagoda, Van Thuy Tu and many other valuable cultural, historical and tourist sites. Vietnam’s most visited tourist destination 148. Mekong Delta. As part of the Mekong Delta, also known as the Southern Plains or the South West, the total area is 40,548.2 square kilometers. Due to the long coastline and the Mekong River divided into many tributaries of rivers, canals, islands and archipelagoes, this place is suitable for ecotourism, experience and discovery. The Mekong Delta, in addition to visiting the extensive fruit orchards, on one of the 9 branches of the Mekong River to the sea, listening to the music and pay tribute to the amateurs. As for the specialties in the South, visitors also find it hard to overlook the floating markets, a feature only in the west of the country. Top 10 tours to visit the most beautiful in Vietnam. Cu Chi Tunnels. It is a defensive system in the ground in Cu Chi district, the land is called “land of steel”, 70 km away from Ho Chi Minh City to the northwest. This system was built by the National Front for the Liberation of South Vietnam during the Indochina War and the Vietnam War. This is a unique architectural monument in Vietnam. Located deep in the ground, there are many floors, many nooks like spider webs that are over 200 km long, which is the place to eat, stay, meet and fight our people. With 3 different deep layers, the upper floor is about 3m from the ground, the middle floor is about 6m from the ground and the bottom floor is 12m deep. Ben Dinh and Ben Dinh dioceses have been recognized by the State as historical monuments of the national level. Top 10 tourist sites in Viet Nam look like 1810. Nha Trang. It is a coastal city and a political, economic, cultural and tourist center of Khanh Hoa Province in the South Central Coast of Vietnam. The land of sea is also famous for its Salanganes’Nest, one of the most delicious and nutritious foods enjoyed by kings 400 years ago. Top 10 most visited tourist sites in Viet Nam 19 “Pearl of the East,” Nha Trang not only owns the natural beauty, cool with the stretch of white sand, the offshore islands have virtual coral ecosystem, but also famous by There are many ancient Cham temples, mesmerizing museums in the heart of the city.